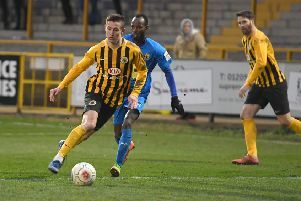 Ryan Cresswell wants to make the ‘perfect’ home debut as Boston United host Curzon Ashton on Saturday. 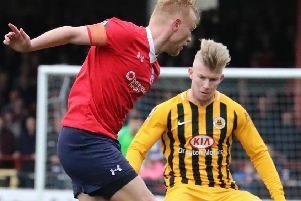 The former Southend United, Bury, Rotherham United and Macclesfield Town centre back linked up with his new Pilgrims teammates less than two hours before Saturday’s 2-2 draw at York City. And now, after getting to know the players around him a little better this week, he wants to help United to overcome their frustrating recent home form. “Three points and a clean sheet would be perfect,” the 31-year-old said of Saturday’s contest at the Jakemans Stadium (KO 3pm). Cresswell arrived from Mickleover after beginning the campaign at National League Eastleigh. And although manager Craig Elliott is hoping his latest signing could be a member of next season’s squad, the defender wants to get back in the groove following a frustrating period with injuries. “I’ve played one 90 minutes in 11 months, so the idea of coming to Boston is playing games, minutes and getting fit,” Cresswell added. “The sooner the better. I’ll be working hard in the week to get better. “My hamstrings were cramping up (against York). Only minutes on a football pitch can deal with that. “I’m seeing it as a game of football next Saturday. We spoke briefly on next season, which is something which is appealing to me. But regular football at a standard like this is what I need. Cresswell arrived as Spencer Harris departed the club, his contract terminated by mutual consent. The summer signing netted on his debut for Ramsbottom United on Saturday, helping the club out before he prepares to head over to Australia to carry out best man duties at a friend’s wedding.